by Robert D. Howell, Sr.
by Thomas P. Jones, Major General, AUS, Ret. Indiana Genealogist is distributed to members of the Indiana Genealogical Society as a benefit of membership. The Indiana Genealogical Society is looking for someone to take over as the Central District Director. District Directors act as liaisons, relaying information on the activities, news and concerns of individuals and organizations in their area, including Indiana County Genealogists. The Central District Director represents the interests of those in Boone, Clinton, Hamilton, Hendricks, Johnson, Marion, Morgan and Tipton counties. District Directors are 3-year positions subject to re-election. The term of Central District Director will expire in April 2009. District Directors are part of the IGS board and as such, are responsible for submitting written reports on their area's activities and attending quarterly IGS board meetings, which are usually held at the Plainfield-Guilford Township Public Library in Hendricks County (the fall board meeting is usually held at the Allen County Public Library in Fort Wayne.) Mileage to and from board meetings is subject to reimbursement at the IRS-approved rate of $0.14 per mile. Each April at the IGS annual conference, the Indiana Genealogical Society recognizes and honors individuals who have contributed to the furthering of genealogy research in Indiana. The nominees do not have to be IGS members. This is a great opportunity to let the public know about deserving people whose projects or publications have helped researchers in your area. If you would like to nominate someone, please visit the Awards section of the IGS website for a nomination form and more information on the awards available. Nominations must be received by January 15, 2008, and the winners will be recognized at the IGS annual conference on April 5, 2008 in Evansville, Indiana. Registration is now open for the Indiana Genealogical Society's annual conference, which will be held Saturday, April 5, 2008 at The Centre in Evansville, Indiana. Nationally-known lecturer J. Mark Lowe will be the featured speaker, with topics that will include World War I records, Kentucky research and Internet research. Willard Library will be open from 9 am to 8 pm on Friday, April 4, 2008 for conference attendees who arrive early and want to get in some extra research beforehand. IGS will also hold a society management workshop during the day on Friday, April 4, 2008 (details will be announced later). The Executive Inn, Evansville is near The Centre and is offering rooms for $69 a night (plus tax). Reservations must be made before March 5, 2008, and a credit card or advance deposit is required. To make reservations, visit their website, or phone (877) 424-0888. The South Bend Area Genealogical Society will meet November 26 at 7 pm at the First Christian Church of South Bend (1101 E. Jefferson Blvd., South Bend IN). Kristin Lewis of the University of Notre Dame will present a program on the DNA Genographic Project. The DeKalb County Indiana Genealogy Society will meet December 10 at 6:15 pm at the Eckhart Public Library in Auburn, Indiana. Roger Lash will present a program, "Trash or Treasure," where he will appraise antiques and other treasured items that people bring in. The Wabash County Genealogical Society will meet on Monday, November 19 at 6 pm at the Grandstaff/Hentgen Funeral Home (1241 Manchester Ave., Wabash IN). Elizabeth Collins will discuss her 4-H Genealogy Project and the Wabash County 4-H's study of genealogy. The public is invited to attend. The Brown County Genealogical Society will celebrate its 20th anniversary with a dinner celebration on Tuesday, December 11 at 5 pm at the Parkview Nazarene Church in Nashville, Indiana. The society's founder, Gladys Tratebas, will be honored. The society holds its meetings on the second Tuesday of every month at the Brown County Public Library in Nashville, Indiana. The public is welcome to attend. The Indiana Historical Society will offer a workshop, "My Grandma Swam with Snakes: How to Begin Genealogy Research," on December 8 from 10 am to noon at the Indiana History Center (450 W. Ohio St., Indianapolis IN). Jeff Harris, director of Local History Services for the Indiana Historical Society, will give an overview of the reference tools needed to begin family history research, including censuses, vital records (birth, death and marriage), court records, naturalization records, and church and cemetery records. The Lake County Public Library wants to help you bring your family together. Looking into the past has never been easier or more fun, because the library has assembled a premiere collection of historical and genealogical resources to help you find your elusive ancestors. After all, only a genealogist regards a step backwards as progress! Using our trio of databases makes searching for birth, marriage, and death records a snap. We have all the country’s rich census data in our Ancestry Library Edition (we bought the subscription so you won’t have to) and Heritage Quest computer databases. Our ProQuest Obituaries database will make finding obituaries and death notices from many prominent newspapers quick and easy. Like books? The depth and breadth of our collection is impressive. Look at our books of passenger ship lists, and perhaps you will find a relative’s name among those who braved the seas to come to America. Use our naturalization records to learn what country your ancestors departed from and their ethnic background. Are you eligible to join the Daughters of the American Revolution? Use our resources to find out. Internet enthusiasts can visit the Genealogy and Indiana Roots link on our website to learn more about all our exciting genealogical resources. While you are there, be sure to visit our “Region Roots ~ Northwest Indiana Genealogy” blog for a quick dip into everything genealogy. Check back with “Region Roots” often to learn more about upcoming genealogy programs and our monthly genealogy class. Yes, we are offering a genealogy class! The genealogy searching class meets on the first Tuesday of each month from 10 am-noon. This class introduces you to the wealth of information available in our trio of genealogy databases. Seating is limited, so be sure to pre-register—phone (219) 769-3541 ext. 334. Does all of this sound a little overwhelming? Our new Indiana Librarian, Susan Killin, will be available to guide you as you get started using all our resources. Call (219) 769-3541 ext. 336 and make a genealogy appointment with Susan. The National Archives and the Genealogical Society of Utah recently announced an agreement to digitize and index the National Archives' collection of 1.28 million pension files for Union veterans of the Civil War and their widows. The partnership will begin with a pilot project, whereby the first 3,000+ of the pension files will be digitized and indexed. These pension files are currently only available at the National Archives in Washington, D.C.; when completed, the digital files and index will be made available at all National Archives branches. The National Archives will also have the option of designating a third party to host the files online, such as FamilySearch.org or a subscription-based website. The pension files contain a treasure trove of information for genealogists because the claimant had to include supporting documents with their application. These supporting documents can include birth, marriage and death records. Currently, the only other way to see the pension files (besides in person in Washington, D.C.) is to request a photocopy of the file. In October, the National Archives raised the fee they charge for copying these pension files to $75 for the first 100 pages. The Northwest Indiana Genealogical Society has published 1891 Plat Map for Lake County, Indiana. It is 605 pages, with comb binding, and contains the plat maps for 10 of the 11 townships that existed in 1891, plus a 5,000 entry every-name index (which also includes the legal descriptions of the land). The maps make it easy to see where your ancestors owned land and who their neighbors were, and it can also be used as an 1890 census substitute. The book costs $75 + $5.75 shipping & handling. Make checks payable to Northwest Indiana Genealogical Society and mail to: Northwest Indiana Genealogical Society, P.O. Box 595, Griffith IN 46319. The central branch of the Indianapolis-Marion County Public Library is set to reopen on December 9. The library, which is located at 40 E. St. Clair St. in downtown Indianapolis, has undergone a lengthy construction project, which began in 2002. It operated out of an interim location until this September, when it closed in preparation for the move back into the expanded building. When it reopens, the library will include an Indianapolis Special Collections Room, full of archival materials about Indianapolis and Marion County. The library also has a collection of Indiana newspapers on microfilm. The Indiana Genealogical Society is now accepting nominations for candidates for its District Director positions for the Northwest, North Central, and Northeast districts. The election will be held in April 2008. The Northwest District consists of: Benton, Jasper, Lake, La Porte, Newton, Porter, Pulaski, Starke, Tippecanoe, Warren and White counties. The North Central District consists of: Carroll, Cass, Elkhart, Fulton, Howard, Kosciusko, Marshall, Miami, St. Joseph and Wabash counties. The Northeast District consists of: Adams, Allen, Blackford, Dekalb, Grant, Huntington, Jay, Lagrange, Noble, Steuben, Wells and Whitley counties. District Directors must be members of IGS in good standing, a resident of the district they represent, and attend quarterly board meetings. It is a 3-year term. They act as a liaison for the individuals and organizations in their district (including any Indiana County Genealogists), communicating with them in person (by attending meetings, workshops, etc.) and/or through mail/e-mail/phone, providing information about IGS activities and also seeking information from them about their meetings, publications, ongoing projects, etc. Mileage to and from board meetings is subject to reimbursement at the IRS-approved rate of $0.14 per mile. The Indiana Genealogical Society's Library Staff Educational Scholarship includes a $500 credit for the library employee to use to attend any conference, seminar or class that is related to genealogy. This credit is to be used towards the registration fees, and can also be applied towards food or travel expenses. The deadline to submit an application is December 31, 2007. The Williamsport-Washington Township Public Library is scheduled to reopen in about 2 weeks. A fire on the night of October 8, 2006 caused over $2 million in damage and destroyed most of the library’s collection, including its genealogy and local history books. The fire (which was ruled to be arson) caused the library to relocate to an American Legion building during the rebuilding process. The library rebuilt at its original location, which is across the street from the Warren County courthouse. Access has also been restored to the Warren County, Indiana Historical Records Database, which is a joint effort of the library and the Warren County Historical Society. Five counties in southwestern Indiana that were previously part of the Central time zone have switched to the Eastern time zone. The counties involved are Daviess, Dubois, Knox, Martin and Pike. The switch took effect at 2 am this morning, when Daylight Savings Time ended. Twelve counties in the southwest and northwestern parts of the state remain in the Central time zone. They are: Gibson, Perry, Posey, Spencer, Vanderburgh and Warrick (in the Evansville area) and Jasper, Lake, LaPorte, Newton, Porter and Starke (in the Chicago area). The other 80 counties in Indiana are in the Eastern time zone. The Wells County Genealogy Society is working on an every-name index to the Wells County deed books and is currently about halfway through indexing these 55 volumes. When complete, the index is expected to be published in both book and CD format. The North Webster Community Public Library (301 N. Main St., P.O. Box 8, North Webster IN 46555) will be hosting a Genealogy Roundtable on Monday, November 12 from 10 am to noon in their Local History and Genealogy Center. For more information, phone (574) 834-7122. The Tri-County Genealogical Society is offering beginning genealogy classes the second Wednesday of every month at 5:30 pm at the Batesville Memorial Public Library before their regularly scheduled meetings begin there at 7 pm. Society members will present different topics throughout the year. To reserve your space, contact Marjorie Weiler-Powell. Russell Wilhoit will be giving a beginning genealogy class in December at the Greensburg-Decatur County Public Library. For information on the specific date and time, as well as to reserve your space, contact him. Searching for the families of Joseph Barkley (born 1822) from Kentucky, who married Barbara Denton (born 1828) of Harrison County, Indiana. They moved to Iowa, as their first son William C. Barkley was born there in 1850; they settled in Cedar County, Missouri by 1850-1860. Russell Wilhoit, Indiana County Genealogist for Decatur County, has been picked to lead the newly-resurrected Decatur County Cemetery Commission. The commission, which was last in existence in the 1980's, focuses on the care of cemeteries, particularly pioneer cemeteries (those with the earliest of burials). Searching for information on the ancestry of Lyle Adair who was born near Logansport, Cass County, Indiana on 11 March 1843. His parents were Benjamin and Nancy T. Adair. He died in Terre Haute, Vigo County, Indiana in 1918. "Ancestor Hunters," the Genealogical Interest Group of the Delaware County Historical Society, will meet on Monday, October 29 at 6:30 pm at their Resource Centre in Muncie (located at 120 E. Washington St., Muncie IN 47305). Video will be shown of a presentation by the late Ting Morris on what you can learn from cemeteries. The program is free and open to the public. The Scott County Genealogical Society has published Scott County Births & Deaths 1820-1999 (556 pages). It is a compilation of birth and death information on Scott County residents, as submitted by researchers, and it includes a surname index. The cost is $35 +$5 shipping & handling (Indiana residents must also add $2.40 for sales tax). Make checks payable to Scott County Genealogical Society, Inc. and mail to: Scott County Genealogical Society, Inc., P.O. Box 23, Scottsburg IN 47170. Frank L. Roberts was a stonemason or brickmason and the family was in the 1900 census in Hickory Grove Township, Benton County, Indiana, then in the 1910 census in Blackwell, Kay County, Oklahoma. Leona Roberts married C.O. Beard (born 1895) in Genda, Kansas, in 1912. Leona and her husband, Jack Beard (born about 1887 in Kansas) are in the 1920 census in Vernon Township, Kay County, Oklahoma. Their son, Turley Duane Beard (born about 1914 in Kansas), was my grandfather. He married Alta Pierce and had 4 kids. If anyone knows any information on the Beards or Roberts families, please let me know. Mrs. Benjamin Cooper (Easter) died circa 1827, and is buried in Fulton County, Indiana, probably in the Sand Hills Cemetery. Her daughter, Sarah (Sally) was married to William Polke. It is presumed that she came to live with William and Sally after the death of her husband in Shelby County, Kentucky. The last name, Easter, is what is listed in the will for Benjamin Cooper, and also the name given on the marital permission for Sally. Does anyone have access to the inscription on her gravestone, that they could see if it lists her birth and death dates? John A. Jefferson and wife, Tempeanna Downey (born about 1840 in Ohio), married October 3, 1860. Tempeanna may have been a native Indian. They had two children, William Oliver Jefferson (born 1863) and Charles (born 1864). Tempeanna Jefferson is listed as the head of household in the 1870 census for Liberty Township, Wabash County, Indiana. I am looking for John A. Jefferson's date of death in Wabash County, Indiana--tradition has it that he was killed by Indians. Jackson County Historian Charlotte Sellers spoke before the Jackson County Commissioners recently and asked them to take steps to protect and make accessible the county's records, some of which date back to 1816. She noted the presence of mold on some early court records. In response, the commissioners have asked her to form a committee to investigate the possibility of creating an archive or other kind of storage facility. Sellers is inviting genealogical and historical societies, independent researchers, the Jackson County Records Commission, and school corporations, as well as those in the media and legal community, to participate in the committee. 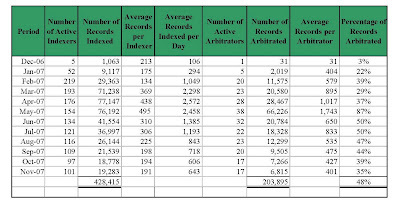 In addition, members of Leadership Jackson County will be asked to help inventory the records. Input from anyone who has had experience setting up a county archive is welcomed. Charlotte Sellers may be contacted at (812) 522-3412 ext. 240. Seymour Museum, Inc. is having a fundraiser at the Riverview Cemetery in Seymour, Indiana on Saturday, November 10 at 2 pm. The cemetery is observing its 125th anniversary, and there will be a tour offered of the cemetery, with volunteers offering colorful profiles of some of the area's settlers, such as the Honorable Jason B. Brown, an often-married lawyer accused by Detective Allen Pinkerton of defending members of the Reno Gang while under retainer to the Adams Express Company. Tickets for the cemetery tour are $6.99 through November 3, then they will be $9.99. Tickets may be picked up from: Artistic Impressions, 127 W. Second St., Seymour IN 47274. If you order a copy of Saving Seymour Stories: Bits From the First 50 Years (cost $17.99), you'll get two free tickets. Questions about the event may be directed to Charlotte Sellers, Jackson County Historian and Seymour Museum board member--phone (812) 522-3412 ext. 240. Looking for any info on my grandmother Martha Hardesty who married Thomas E. Blacketer(born January 19,1914; died November 1987; son of Thomas Blacketer and Mary Martin) in Rockville, Parke County, Indiana. The Bartholomew County Genealogical Society (P.O. Box 2455, Columbus IN 47202) will meet October 27 at 1 pm in the Basement Conference Room of the Bartholomew County Public Library in Columbus, Indiana. There will be a program about what how to find out about local resources and use that in long-distance research. The Owen County Historical & Genealogical Society will meet November 20 at 7 pm at the Owen County Public Library in Spencer, Indiana. Lyle Brighton will present a program about the early days of Gosport, including the infamous bank robbery. 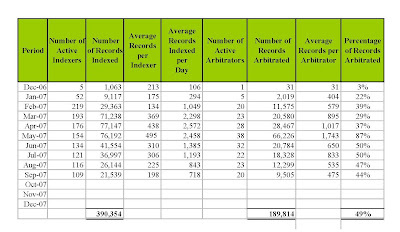 Here are the statistics on the Indiana Marriage Indexing Project through the end of September--note that we have indexed almost 400,000 records! FYI, FamilySearch is working on getting some of our records ready to put online shortly, so watch for them! The Randolph County Historical Society continues to make progress in its restoration of the Old Winchester Graveyard (originally known as Heaston Cemetery), which is located on Western Avenue in Winchester, Indiana. This pioneer cemetery was established in 1844 and was an active site for burials until the 1890’s. When the restoration project was first started in 2004, only 7 tombstones were left standing out of the 200+ people known to be buried there (including several veterans of the War of 1812 and the Civil War). Thanks to extensive work by cemetery restoration experts, 80 tombstones have been discovered buried underground thus far, with more expected to be found. It is an expensive process to reset, restore and/or replace the grave markers—over $9,000 has been spent on the project thus far, and there are also plans to ensure the continued care and maintenance of the graveyard after the restoration project is completed. The Randolph County Historical Society received a cemetery preservation grant from the Indiana Genealogical Society in 2006 to help with the project, and has also developed an “Adopt A Pioneer” fundraising program, where for $150 (the cost of restoring one tombstone) donors can adopt one of the pioneers buried there and get assistance in finding out about their lives. Donations are tax-deductible. Checks should be made payable to Randolph County Historical Society and mailed to: Old Winchester Graveyard Restoration Fund, Randolph County Historical Society, 416 S. Meridian St., Winchester IN 47394. I am trying to find out information about my baby sister, Bonita Gay Banton, who was born October 3, 1943 and was 3 months, 15 days old at her death. She was buried in Anderson, Madison County, Indiana. I am hitting a brick wall and do not know where to go. I am looking for information regarding a Mac Townsend and Maggie Crawford. They were the parents of Ralph Potter Townsend, who was born on January 27, 1883 in Mt. Vernon, Posey County, Indiana. I would like to find a birth record for Ralph Potter Townsend or a marriage record for Mac Townsend and Maggie Crawford--I'm sure that "Mac" is probably a nickname, but that is what was listed on the death record for Ralph Townsend. I am looking for family - any relations to Father Gilbert D. Wilson, who was born in Marshall County, Indiana in 1929. He was adopted by Roy and Lorretta Wilson of Cass County, Indiana. I am looking for a death notice and any history on a ?Carson? Savari. He died in a car train wreck, possibly in the mid 1970's. I am not sure if the name is spelled correctly, but he may have had a son, also named Carson, who would be about 50 years old. Carson--the dad--most likely lived in South Bend, St. Joseph County, Indiana and was married. Any information concerning the elder Savari would be helpful. I am trying to trace the family of my great-grandmother, Josephine B. Fuerbach (or Feuerbach). She was born December 1868 in Indiana to Michael F. Feuerbach (born about 1842 in Bayern, Germany) and Barbara Weitzel or Whitesell (born about 1846 in Ohio), who married January 31, 1867 in Vanderburgh County, Indiana. Josephine Fuerbach was married April 21, 1886 in Vanderburgh County, Indiana to Charles G. Phipps (born August 1862 in District of Columbia; son of William Phipps and Sarah Lawrence). In the 1900 census they lived in Evansville, Vanderburgh County, Indiana. I'm trying to locate the ancestor in my family who came over from Ireland (name, date, etc.) I have traced back to James Garrity, who married Catherine Burris of Boone County, Indiana. They had a son, James Norman Garrity (born February 23, 1890; died January 25, 1961), who married Edna Myrtle Means (born September 8, 1892 in Shelby County, Indiana; died July 30, 1957). Edna was the daughter of Charles Harrison (Harry Means??) and Ollie Etta Dake. I am seeking information about my great-great-grandfather, Dillon Brooks Brown. He was born April 26, 1826. He came by wagon train from Washington County, Ohio as a small child. As they traveled from Ohio, his parents were killed in a wagon train accident near Crawfordsville, Montgomery County, Indiana. He had one brother and they were each taken in by different families and lost contact. He remained in the Crawfordsville area and married Susannah Hendricks March 7, 1850 in Montgomery County. This history was told to me by my father and uncle. I cannot find any other information about him while he lived in Indiana or any record of the wagon train accident. I do not know his parents' names. I also would be interested to know Susannah Hendricks parents' names and her siblings. The Wabash County Genealogical Society will meet October 15 at 6 pm at the Grandstaff/Hentgen Funeral Home (1241 Manchester Ave., Wabash IN). Parking, as well as the entrance to the meeting room, is located in the rear of the building. John Dunnagan, Vice Chief of the Miami Indian Nation of Indiana, will give a program about the history of the Miami Indians, who were among the early settlers of Wabash County. --October 13--The GSMC will meet at 11 am at the LDS Family History Center west of the Indianapolis Zoo (110 N. White River Parkway, Indianapolis IN). Sharon Kennedy will give a CD presentation of visits to areas of Germany and Luxembourg, including several German archives and the Luxembourg American Military Cemetery. --November 10--The GSMC will meet at 11 am at the LDS Family History Center west of the Indianapolis Zoo (110 N. White River Parkway, Indianapolis IN). Ron Darrah will speak on probate records. --December 8--The GSMC will meet at 11 am at the Crown Hill Cemetery Waiting Station (West 34th Street and Boulevard Place; enter from the back of the building) for their annual meeting, annual conference, pitch-in and show & tell. Memberships in the Indiana Genealogical Society are now being accepted for 2008! Libraries and organizations, as well as individuals, are welcome. Membership is based on the calendar year, so all memberships will expire December 31, 2008. Memberships can be purchased (or renewed, for existing members) online at http://www.indgensoc.org/membership.html (there is also a printable membership form). It’s too bad we can’t get to those county clerks who decided to use their own forms and do things differently! They sure are complicating life for this project at times. Number of marriages – leave the field empty if the answer is first, 1st, First. If the answer is once or 2, then index it exactly as it is written. The overall rule is that we never count this marriage – we only want to know about previous marriages, if any. License date field – can’t really do anything with it except mark it blank if no license date is given. After given different instructions earlier, I’ve realized that putting the marriage year in that field is going to be misleading to future researchers. I actually had that very problem (still do) with one of my ancestors. The license date was included with some marriage dates for other couples and it has been published on the Internet in many places as the marriage date. Once that false information is out there, it’s really hard to get the correct information accepted. Wednesday October 3, 2007--Daughters of the American Revolution--"Research Assistance for Membership"
The group seeks to identify, preserve and honor the people and places of Indiana that were involved with the Underground Railroad and the freeing of African-American slaves. --On October 13 from 1 to 3 pm Marlene Polster will speak on "Lake County Historical and Genealogical Resources." --On October 20 from 1 to 3 pm Richard Lytle will speak on "German Heritage in the Region." I am searching for any information about a Frank Turner. He was born in 1852 somewhere in Kentucky and died 27 April 1894. He is supposed to be buried in the Bargersville Cemetery in Johnson County, Indiana but I have not been able to confirm this. He is my great-great-grandfather. I know he was married to Rosella Vaughn and she was from a prominent Johnson County family. Does anyone have advice about how I can access local records? I want to know where Frank was buried or who his parents are. I am looking for anything at all on Lorenzo Pegg. I have him married to Susannah McIntosh in Miami County, Indiana before the Civil War, but nothing after that. I am particularly interested in finding his parents, date of birth, and date of death. We seem to be getting lots of marriage license applications now but with no marriage date and the only official's name is that of the county clerk. DO NOT try to include a date or an official's name. Simply mark these fields as blank (CTRL+B). Doing anything else would be including some misleading or even false information in our index. Researchers will still be able to search by names of the bride and groom or even the county and find these records. I am trying to find a place of death for a Barbara Coy who was born April 16, 1747 in Pennsylvania and died August 9, 1854 in Indiana (I do not know where). Her husband was Daniel Coy. Looking for information on James H. Chamberlain, who was in the Civil War. He was a private in Company F of the 31st Indiana Volunteer Infantry. He enlisted September 21, 1861 in Clay County, Indiana and was discharged January 28, 1863. He is buried in the Fairview Cemetery, Madrid, Iowa. I have no other information on him. Who were his parents? Did he have a wife and children? Is he the same as James Chamberlain who was born 31 December 1794 in Kentucky and died 13 January, 1887 in Douglas Twp., Boone Co., Iowa? I am looking for information on Elijah Thomas Gardner (born about 1842 in Indiana) who lived in Linton Township, Vigo County, Indiana in the 1870 census. He had a wife Elizabeth (born about 1847 in Kentucky) and children Sarah E. (born about 1865 in Indiana), Amanda J. (born about 1868 in Indiana) and Charles (born about April 1870 in Indiana). I am wondering what happened to him. I was told that all his family died close together and only young son Charles survived. Did they die from cholera? Also, I would like to know when Elijah Thomas Gardener and Elizabeth got married. I found in a marriage index for Vigo County that a Charles Gardner (age 25) married an Ethel Burgan on July 28, 1895, and it listed his father as T. and his mother as Elizabeth Blair. This appears to correspond with a Thomas Gardner who married Elizabeth Blair on November 7, 1861 in Vigo County. Is he the same as my Elijah Thomas Gardner? A distant relative of mine, Eliza Follick, married a man by the name of James Marsh, and it is believed that they resided in Fountain County, Indiana. Before her marriage, Eliza lived with her mother on a farmstead near Waynetown in Montgomery County, which is to the east of Fountain County. Is there any record of her? Eliza would have been born about 1820, therefore, her death should have been in the years 1875 to 1895. I appreciate any assistance. I am looking for information on a Nelda Morris born in approximately 1863. The Morris family supposedly lived in Muncie, Delaware County, Indiana. I am also looking for the marriage of April (or close that as a first name) Morris to a Harry Cultice, which possibly took place in 1875 or later, but no earlier than 1860. They had three children from this marriage, all females. Harry Cultice was an organist for a Protestant church in the Muncie area in the 1870s and 1880s. I am also looking for a divorce announcement of A. Morris Cultice from Harry Cultice, and any cemetery information for the burial site of Nelda Morris or any of the people listed above. Looking for information on Edward William Evans, who was born about 1807. Some census records show his birthplace as Virginia, others show it as Ohio. He married Sally (Sarah) Mock in Randolph County, Indiana in 1830. Looking for information on the family (brothers, sisters or parents) of Edward. Looking for information on a David Stallcop (may also be spelled as Stalcop or Stalcup), husband of Elizabeth Elson. He was born in Kentucky and is believed to have died in Clay County, Indiana sometime after the 1840 census and before the 1850 census. He is said to be the son of Swithin Stallcop, but I have yet to find absolute proof of this. I have already checked for a will and it doesn't appear David had one. I found the marriage certificate for him and his wife in Lewis County, Kentucky. I am searching for the naturalization papers of my ancestor, John Farr. According to his gravestone, he was born 2 November 1836 (we think in Wales) and died 7 September 1875 in Hamilton, Butler County, Ohio, where he is buried. He was married to Louise Feight in Richmond, Wayne County, Indiana on 27 July 1868 (I have a copy of the marriage license, obtained from the Wayne County Clerk of Courts office). There was another John Farr, whose naturalization papers I did obtain, but his birthdate does not match the one on my ancestor's gravestone. Also, it indicates that he was from Prussia, not Wales. The Wayne County Clerk of Courts office has no record of another John Farr other than the one who was from Prussia. Looking for any information on Charles Sharp (born December 1867 in Indiana; died 1910-1920) and his wife Charlotte "Lottie" O. Smith (born March 1871 in Indiana; died after 1920), who married 7 April 1889 in Clinton County, Indiana. They lived in Hillisburg, Clinton County, Indiana. They were in Johnson Township, Clinton County, Indiana for the 1900 census and Anderson, Madison County, Indiana for the 1910 census. Lottie is a widow in the 1920 census, living in Kirklin, Clinton County, Indiana. --Zerna A. Sharp, born 12 August 1889 in Clinton County, Indiana; married - no; death: 1981? I am doing research on my family tree. I have gotten as far back as a William Osborne Branen born 1820 in Indiana. All I have been able to find about his parents was that the mother's name was Martha born in 1792 and the father was born in England in 1788. I would appreciate any information you could provide. I would like to find information on a Daniel Coy and his wife Barbara Callahan Coy. Barbara was said to have died in Indiana on August 9, 1854. Daniel was said to have gone back to Pennsylvania. I do not know what county in Indiana they were in. The Jackson County Genealogical Society (http://www.rootsweb.com/~injackso/resources/gensoc.htm) has just published Hamilton Township Cemeteries, Jackson County Indiana, the latest in their series of cemetery indexes for each township. The book is 325 pages and is spiral-bound. The cost is $40 +$3 shipping & handling. Make checks payable to Jackson County Genealogical Society and mail to: Jackson County Genealogical Society, 415 1/2 S. Poplar St., Brownstown IN 47220-1939. The Allen County Genealogical Society of Indiana (http://www.acgsi.org) is sponsoring a Beginner's Workshop on Saturday, October 6 from 9:30 am to noon at the Allen County Public Library (http://www.acpl.lib.in.us). The workshop will be held in Room C (on the library's 1st floor) and will include information on basic methods to begin successful searching, as well as proven methods to keep your searching on track. There will also be a tour given of the library's genealogy department. I am looking for information on my Grandfather Cletus J. EARLY. He was born on 21 Febuary 1895 in Muncie, Delaware, Indiana. He married Martha Irene JONES of Muncie and moved to Los Angeles, Los Angeles, California by 1930. Cletus died an 1 April 1964. Eunice CRAMPTON, probable daughter of Samuel and Anna Crampton, married Alexander TEMPLE on 25 March 1847 in Wayne County, Indiana. Samuel Crampton lived in New Garden, Wayne County, Indiana in 1840. By 1850, Samuel and Anna Crampton had moved to Salem Township, Henry County, Iowa and were neighbors of Alexander and Eunice (Crampton) Temple. Merrich and Joshua Crampton were also listed in the 1840 census in Wayne County. I am searching for more information about Eunice Crampton. The Indiana Genealogical Society is now accepting applicants for the position of Editor of the IGS Newsletter, to start work in January 2008. The newsletter is 24 pages long and contains time-sensitive information about genealogical news pertaining to Indiana, as well as regular columns. It is published 6 times a year. The editor is paid $300 for each of the 6 issues, for a total annual salary of $1,800 a year. --Ability to generate Adobe Acrobat files. --Access to sources of genealogical and historical news, such as websites, blogs and other print publications. --Compile, edit and proofread each issue in a timely fashion. --Keep informed of genealogical and historical news and write articles on relevant items as necessary. --Receive regular columns (such as queries and “Once A Hoosier…” entries) and edit as necessary. --Post relevant items to the IGS blog in a timely fashion. --Coordinate with IGS board members, committee chairs, etc. to promote IGS activities in the newsletter, IGS blog and other media. Application materials will be received on a rolling basis until the position is filled. The IGS publications committee will review the application materials as they are received and make a decision. The Genealogy Society of Southern Illinois (http://www.rootsweb.com/~ilgssi/) will hold their annual Genealogy Conference and Book Fair on Saturday, October 13, 2007 from 9 am to 4 pm at the Ray Hancock Conference Center of John A. Logan College (700 Logan College Rd., Carterville IL 62918-2500). Curt Witcher from the Allen County Public Library in Fort Wayne will be the featured speaker, with topics including "Using Military Records for Genealogical Research," "Mining The Mother Lode: Using Periodicial Literature for Genealogical Research," "Using Government Documents for Genealogical Research" and "Pain in the Access: Getting More From The Internet For Your Genealogy." Looking for any information about Joseph Barkley of Harrison County, Indiana who married Barbara Denton in approximately 1843. He moved to Cedar County, Missouri and is first found there on the 1860 census (the name was misspelled as Bartley). The children in the 1860 census entry line up precisely to the entry in the 1870 census, less William C. (the oldest, who would have been age 24). Looking for information on David Godfrey Jenkins and his wife Mary and daughter Dorothy. He belonged to American Legion Post #2, Lodge #264 and the Veterans of Foreign Wars, and was also a member of the Fraternal Order of Police. He was in the army in World War I. I think he may have died in 1954 in Vigo County, Indiana. He lived at 749 West Knight Street in Brazil, Clay County, Indiana. I am especially interested in finding out if he had an obituary. What happened to his wife and daughter? Seeking information on Elmer Hockingsmith. His last known residence was Huntington, Huntington County, Indiana. He was born approximately 1865 or 1866 and died approximately 1938 to 1940. Looking for information on a Jack L. Johnson who is listed on an Indiana title in 1976. The title inquiry from the State only shows Clay City, Indiana--there is no street address given. --Darlene Anderson is the new Central District Director, representing Boone, Clinton, Hamilton, Hendricks, Johnson, Marion, Morgan and Tipton counties. --Susan Bucove is the new South Central District Director, representing Bartholomew, Brown, Clark, Crawford, Floyd, Harrison, Jackson, Lawrence, Monroe, Orange, Scott and Washington counties. Need information on Maria Elnora Fulling, third wife of Clamer Fulling. I believe she might have been previously married to a Mr. Tieman, and that her maiden name may have been Hebbeler. When were she and Mr. Fulling married? She and Clamer had two children: Henry, who married Caroline Thene, and Sarah Ann, who married Henry A. E. Dassel. She and Clamer are buried in Tabor Cemetery in Gibson County, Indiana. Maria died in June, 1895. Elizabeth Dickson (probably Dixon, possibly Gypsy in origin), born about 1808, Indiana. Residence from 1830-1870 was Point Township, Posey County, Indiana. Marriage: William Hancock, 1826, Posey County, Indiana. Marriage: Alexander McCreary (a.k.a. McCarry, McCleary, McCrery), 1843, Posey County, Indiana. Children from marriage: Mary Jane 1844 (my ancestress), Thomas 1850, Sarah E. 1854. By 1870, Elizabeth was using her maiden name once again. Ranch-hand James Morn or Morin also listed in home on census. I very much want to know the death dates and burial places of Elizabeth Dixon (possibly Dickson) and Alexander McCreary, born 1821 in South Carolina, who may have separated and moved to Tennessee. I have no information on either Elizabeth's or Alexander's parentage. There were many Dixons in the area in 1830, two of which had daughters around the right age to be Elizabeth. There were two Dickson households in Black Township, Posey County, Indiana as well but I canot make a valid connection to any of these. Once, I brought up a Spanish land grant to an Elizabeth Dixon in the Indiana Territory, several decades earlier, but I can no longer find it and cannot establish a link to my ancestress. Can anyone help me? I'm open to suggestions. I am seeking proof that my great-great-grandfather William M. Blackburn (who was born in 1816 in Washington County, Indiana) is the son of Joseph Blackburn and Mary/Polly May. In the 1810 census Joseph Blackburn was in Henry County, Kentucky. In the 1820 and 1830 censuses, Joseph was in Washington County, Indiana. Searching for a Jesse Snipes born 1874 and reportedly last seen living in Geneva Township, Jennings County, Indiana. His wife was Elizabeth Thrift. Son Nathan Snipes, Sr. lived in Indiana also, with his wife Margaret Campbell. Any information on Jesse Snipes, Elizabeth Thrift, Margaret Campbell and relatives would be appreciated, as well as notes of Jennings County. I am trying to discover my maternal geneology. My grandparents were Ivan and Erma Butler. They had two daughters, Barbara Erma Butler and Connie Butler. They resided at 1915 Kentucky Ave., Fort Wayne, Indiana. Any help or direction you can give me in this area would be greatly appreciated. I believe my grandfather passed away in September 1975 and my grandmother in 1985? I am sorry but I have very little information. I am searching for information on John and Elizabeth (Border) Lang married 13 November 1856 in Harrison County. From census research it looks like they had 6 daughters. Also it would appear that Elizabeth died between 1870 and 1880 as I don't find her in any censuses after the year 1870. I also believe that John's parents may have been Francis and Nancy Lang as I have found them in District 45, Harrison County, Indiana in 1850. John and three of his daughters had moved on to Kansas by 1885. Family rumor has said that John left for Kansas after killing his neighbor in Indiana over a boundary dispute and the fact that the neighbor had killed his dog. Trying to locate parents of Samuel Elliott born between 1770-1780 in Virginia and died between 1845-1846 in Harrison County, Indiana. He married Mary Polly Kington in Nelson County, Kentucky on 24 February 1799. Mary was born in 1782 in Maryland and died after 1852 in Harrison County, Indiana. I have a copy of Samuel's will listing the following children: Herod, Richard, Gasoway, Lorenzo D. , Elizabeth, James, Gaylon, Mahala, Mildred and John Votan Elliott. Samuel was a farmer but may have also been a circuit rider for the church. I cannot locate any info on Thomas Gillaspy Anderson. On his son Charles Otho Anderson's application for Social Security I found it listed his father as Thomas Gillaspy and his mother as Mesie Jones and said Charles was born in Owen County, Indiana in 1880. I'm wondering if Thomas didn't migrate from another state. I am searching for any information of Windle Grove born April 23, 1776 in Virginia and died October 8, 1856 in Putnam County, Indiana. I am specifically looking for who his wife and children were. He is seen in the 1840 and 1850 census as Windle Grove and Windell Groves in Greencastle, Putnam County, Indiana. His next door neighbor is George B. Grove. I am hoping to connect him to my Wendle Daniel Grove, born 20 September 1825 ? and found in Ripley (1850) and Howard (1860, 1870) counties.